Downsizing to an apartment can be a great step towards creating a more comfortable and convenient living situation for your changing needs. With a smaller space that is easier to navigate and clean, your quality of life will improve with added convenience and reduced stress in your everyday life. While this step is an exciting one, there are some important points to consider for the process. As you make your move into a new space, consider these five essential factors for successfully downsizing to an apartment. No matter which apartment you choose, one essential consideration should be its location. Check to see that your future home is near your job, family, or other amenities that you enjoy such as convenient public transportation, downtown entertainment, and shops, or the gym. Consider where you naturally spend most of your time, as well as where your family and social network tend to be throughout the year. Before you buy or rent a smaller space, be sure to visit the property to get a better idea of just how much room you will be able to work with inside of your new apartment. This consideration may also lead to you consider which of your belongings will fit practically in your new place. Whatever belongings do not fit may be donated or gifted to friends or family members to ensure that you can fit what you need comfortably in your home. One common issue with downsizing is deciding on what to do with the belongings that you have accumulated throughout the years. While it may be difficult to get rid of some things, determining what is necessary to take can also have many benefits for your health. health reasons. Try to determine which of your belongings are essential and which are unnecessary for day to day use or enjoyment. This process will better prepare you for fitting your belongings in a smaller space as you downsize. Although you may be healthy as you are moving into your new apartment, your needs may change over time. With this, it is crucial to consider any potential requirements for your future so that you can easily move throughout your home. Avoid holding on to unnecessary pieces of furniture, as these may eventually become a safety hazard as you are trying to walk around your new apartment. Do you plan on sharing your new apartment with your spouse, child, or roommate? 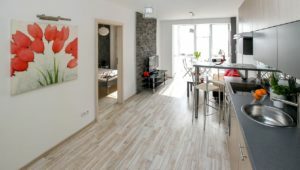 This consideration is an especially important one for considering the future needs of your apartment as well. As you prepare to move into your new home, consider the amount of space that each of you will need to live comfortably in the new space. This entry was posted on Friday, September 28th, 2018	at 10:39 am	and is filed under Residential Sales	. You can follow any responses to this entry through the RSS 2.0	feed. Both comments and pings are currently closed.